You were pretty much the definition of perfection, at least to most you were. You&apos;ve never picked up a cigarette. Not once have you dabbled with any sort of drug. Not one drop of alcohol has graced your tongue. People always thought you and your boyfriend made an odd pair. He was the complete opposite of you. Things you&apos;ve never done hes done plenty of times. 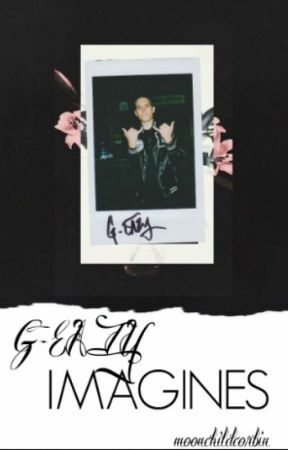 Nobody could ever understand how a sweet girl like yourself ended up with G-Eazy. You sat in the chair across from G with your feet in his lap. You watched him carefully as he pressed his lips to the bottle. He was such a beautiful man, and anything he did seemed beautiful because he was doing it. A smile unknowingly crept upon your face as you watched his every move. "Do you want a drink?" He asked, pointing the bottle in your direction. You scrunched your nose and shook your head. "No, you know I don&apos;t drink." "C&apos;mon, just one sip." He smirked. He&apos;s always respected the fact that you don&apos;t smoke or drink, but he still ask you to do so. "I don&apos;t know." You sighed, fiddling with your fingers. "Just one drink, if you don&apos;t like it you don&apos;t have to drink ever again." He said raising an eyebrow. You bit your lip as you thought about it. "Fine Gerald, but only one drink." He smiled at your answer as he handed you the bottle. You let our a  deep breathe before taking a sip from the cold beverage.The taste was sour, you scrunched your nose and handed the bottle back to G.
"Gross and you drink that by choice?" You made a &apos;blehh&apos; sound and shook your head, making Gerald laugh. "It gets better after a few drinks." He grinned. You rolled your eyes and leaned back against the chair. "There wont be a few more drinks, thats disgusting." "Okay, fair enough. You said one drink and that was one drink." He sighed rubbing your legs. "You don&apos;t have to drink every again, I wont ask you too or anything." You leaned forwards and put your hands on his cheeks. "I love you." You smiled pulling his face to yours and connecting your lips.